HomeCity Real Estate is offering recently sold home prices to homebuyers in the Dallas, Ft. Worth, and Austin areas. Our website now provides homeowners recently sold home prices, sales price history, and our REALTOR®s provide home value information. This is a first of its kind website feature that has been used exclusively by REALTOR®s in the past, but is now available to consumers simply by registering on Homecity.com. HomeCity is taking home real estate sales to a new level by offering information online that has never been offered before. The sales price history is a key piece of data to know how much the home actually sold for in the past. The information will help consumers navigate the red-hot housing market by having all the market data at consumer’s fingertips. Dunham says that even though HomeCity is giving away data that was previously unlisted to the public, he still encourages buyers and sellers to use a professional REALTOR® to help them navigate complex real estate decisions and transactions. “We believe by combining the best real estate agents with state of the art technology we can make a difference by helping consumers buy or sell their homes, “ said Dunham. "You have to register as a user on the website, but the information is free." To check out the HomeCity website go to https://www.homecity.com . What is Recently Sold Home Price Data? Most websites only show the consumer the listing price of a home. When the home sells, the listing disappears from the real estate website, but as most home buyers and sellers know, a home’s actual sold price is what matters. In the past, the only way for a buyer to understand what he or she should expect to pay or for a seller to know how much her home is actually worth, is for a REALTOR® to provide a list of comparable home sales in the area. Unlike other websites, HomeCity.com shows all available data on sold homes from the Multiple Listing Service (MLS). This includes the actual sold price, sales price history, and home value information. Why is Recently Sold Home Price Data important? It’s important to show recently sold home price data on a real estate website because it allows visitors to compare similar sold homes in their area of choice to determine fair market value for the home they are attempting to buy or sell. A comparative market analysis of comparable homes gives the client the ability to decide on a price to sell their home, determine how much to offer a seller for their home, or get a sense of the type of inventory that recently sold in the area you’re looking. 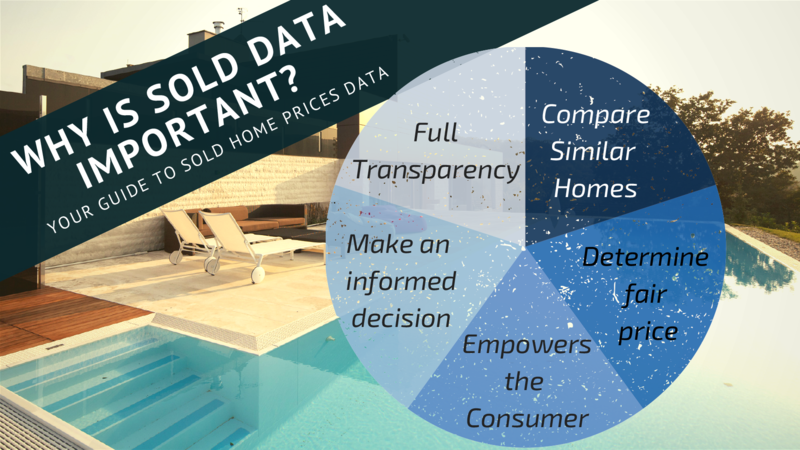 Recently sold home data helps potential home buyers or sellers make an informed decision. Is this information available on sites like Realtor.com, Zillow, and Trulia? No. While REALTOR®s usually syndicate the listing on these sites, these sites are not REALTOR®s, or do not comply with policies that would allow them to show recently sold home price information. Why aren’t other brokerages offering this information to the public? For many years, the real estate industry has been shrouded in secrecy. Most agents and brokers believe that they need to arm themselves with information and provide it only to those who pay them. They are afraid of losing business if consumers have the same information that is available to the agent. At HomeCity, we transforming the real estate industry by turning the system on it’s head. We want consumers to be more educated about the market so they can make better decisions when buying or selling a home and a great way to do that is to make the information available online on our website at homecity.com. We believe by combining the best real estate agents in Texas with state of the art technology and a strong belief in consumer transparency we can provide an unrivaled home buying or selling experiences for our customers. So do I still need a real estate agent? Yes. Closing price data alone is not the only indicator of market value, but it is a valuable piece of information. An experienced real estate agent knows how your home’s unique set a features and location add up to the best market price. A professional real estate agent is best equipped to market your home to get the best possible price. On the flip side, it is harder and harder for a consumer to buy the home they are looking for today because in this hot market the demand is more than supply. A seasoned real estate agent can help you to not only make the right offer for your next home, but actually close on the home of your dreams. Finally, closing on a home is a complex and multi-step process. A lot can go wrong and what you don’t know can hurt you. We believe most people need a professional to help them navigate the complex real estate landscape. When you do a search for homes, under the drop down menu Type, you can select Sold as a filter. You will then be asked to register. You can see a detailed video that takes you through the registration process here. Don’t worry, the information is free.